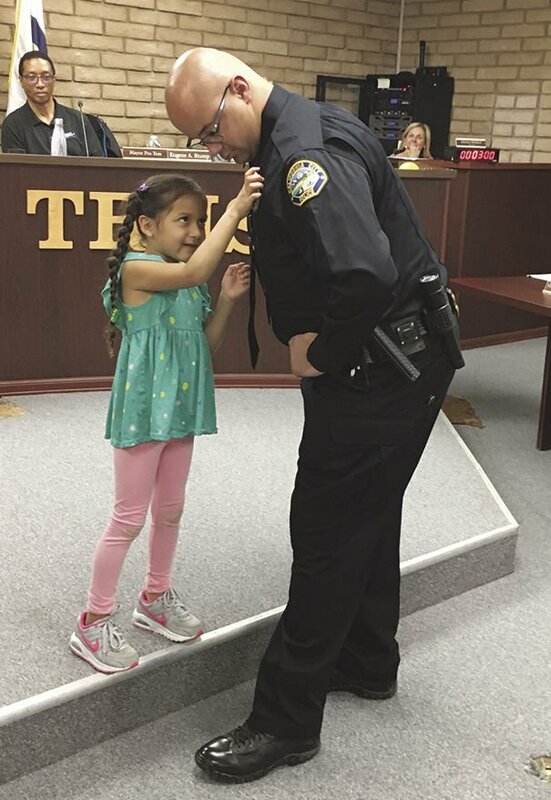 New California City Police Officer Dominique Bennett receives his badge from his 4-year-old daughter Camille during a swearing-in ceremony on April 9 during the City Council meeting. 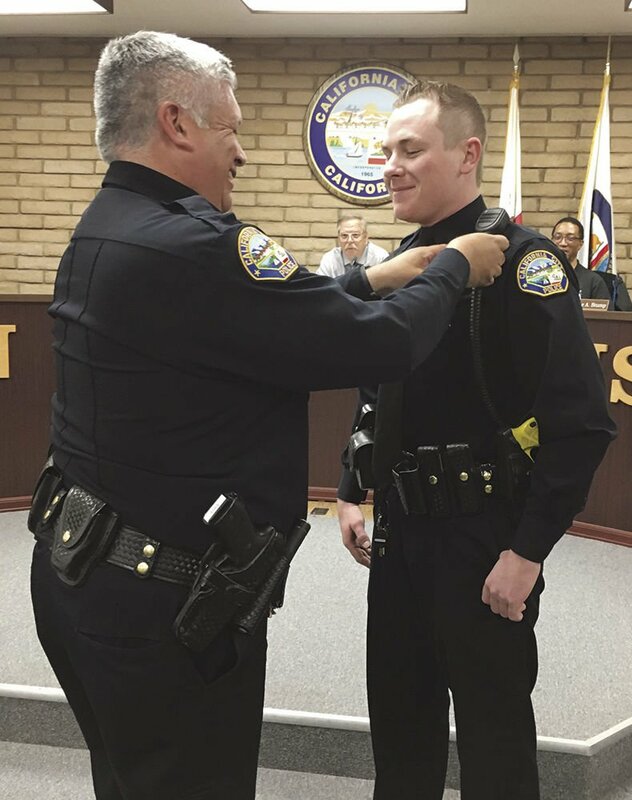 California City Police Chief Eric Hurtado (center) pins the department badge on new officer Connor Walsh during a swearing-in ceremony on April 9 during the City Council meeting. California City Fire Chief David Goodell (right) pins a badge on the department’s newest firefighter/paramedic Matthew Ramold during a swearing-in ceremony on April 9 during the City Council meeting. CALIFORNIA CITY — The city welcomed three much-anticipated new members to its public safety ranks on April 9. Two new police officers were sworn in to join the California City Police Department to help bolster ranks that have been depleted by retirements and departures. An Antelope Valley native and Quartz Hill High School graduate, Dominique Bennett previously served four years in the U.S. Marine Corps. He graduated from the Kern County Sheriff’s Academy in 2018. Connor Walsh grew up in Southern California, graduating from Pacific Palisades High School. He has studied criminology and served as a deputy sheriff for four years in Missouri prior to coming to Cal City, according to Police Chief Eric Hurtado. Also joining the city’s forces is firefighter/paramedic Matthew Ramold, who was sworn in by Fire Chief David Goodell. Ramold grew up in Antioch, California, and worked five years as an emergency medical technician and three years as a reserve firefighter. He attended Sacramento State University for his paramedic training in 2016 and has worked as a paramedic for nine months, Goodell said. “We’re proud to bring aboard a firefighter/paramedic to help us be an even better fire department,” he said.